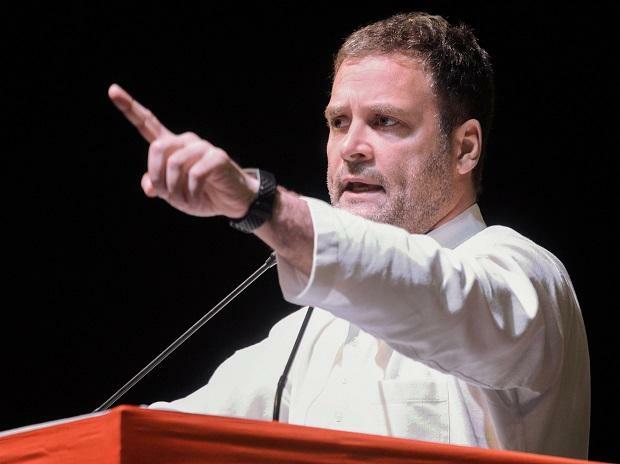 Congress president Rahul Gandhi Friday said his love for Prime Minister Narendra Modi begets anger from the latter, and berated him for 'humiliating' BJP veteran L K Advani. Addressing a poll rally at Chandrapur, Gandhi said, "BJP talks of Hinduism. In Hinduism, guru is supreme. It talks of guru-shishya tradition. Who is Modi's guru? Advani. Joota maar ke stage se utara (Advani was kicked out from stage)." Gandhi said Modi had humiliated Advani, and added that disrespecting one's guru is not Hindu culture. His swipe at Modi over the treatment meted out to Advani follows the BJP patriarch's blog published Thursday where he said his party never considered political adversaries as anti-national. Gandhi's remark was a veiled reference to Advani not getting Lok Sabha poll ticket from Gandhinagar, from where BJP has fielded party president Amit Shah instead. "I love PM Modi. Genuinely, I have no hatred or anger towards the man, but he (Modi) has anger towards me. I genuinely do not have anger towards him," the Congress leader said, during an interaction with students in Pune. Gandhi said his party's manifesto was an expression of the people of India and ruled out burdening the middle class to fund the anti-poverty scheme Nyunatam Aay Yojana (Nyay). Gandhi said, "2019 (polls) is a battle of ideologies and the Congress ideology of brotherhood, love and harmony will win against Modi's hate, anger and divisive ideology." The Congress chief also said he was not bothered by the criticism of the Nyay minimum income scheme promised in the party manifesto. Gandhi said he was inspired by the prime minister's "false" promise of depositing Rs 15 lakh in every Indian's bank account. "I felt direct bank transfer was a good idea. Only the Rs 15 lakh promise was false and I am giving you a true number, Rs 72,000 per year will be deposited in the bank accounts of poor people," he said. "Rs 15 lakh in bank account could not have happened since the economy would collapse. But Nyay can be implemented," he said. If bank loans of a few rich can be waived, loans of farmers and the needy can also be waived, Gandhi said. Targeting industrialist Anil Ambani over the Rafale offset contract, he said, "A person who is not able to make even paper planes bagged the biggest defence contract with Rs 30,000 crore going directly to him. The entire budget of MNERGA scheme was given to a single person." Gandhi said the Congress poll manifesto has been prepared after consultations with all stakeholders. "The middle class will not be taxed and income tax will not be increased to implement the Nyay scheme where Rs 72,000 will be deposited in bank accounts of poor people every year if the party is voted to power," he said. The Nyay minimum income guarantee scheme is estimated to cost Rs 3.26 lakh crore to the national exchequer. The BJP, which has criticised the scheme, has sought to know how it will be funded. Senior Congress leader and former Union minister P Chidambaram has also said the middle class won't bear the burden for implementation of the Nyay scheme. "I have already said in press conference and various interviews: there will be no increase in the tax burden of the middle class. This is our promise," Chidambaram tweeted. Asked about sister Priyanka Gandhi Vadra's twitter post calling him courageous, Gandhi replied, "I am persistent, I stand up for people who are weak." He said the Congress was committed to provide 33 per cent reservation to women in Parliament and assemblies to substantially increase their representation in the state and central legislatures. Gandhi described demonetisation as a "disastrous idea", which had a terrible impact on the economy. He said the exercise, announced in 2016, caused two per cent fall in GDP growth and led to loss of millions of jobs. He said erstwhile Planning Commission was a strategic institution, while its successor Niti Ayaog only talks about implementation and tactics. "We need institutions to strategically think what should be done at the national level. Implementation and tactics can be done by the states," he said, responding to a question on the Congress manifesto promise of scrapping Niti Ayaog, the think-tank set up by the Modi government. On being asked who should take credit for the Balakot air strike, Gandhi said, "the (Indian) Air Force should take credit. It is Important that people know they can't mess around with India." The Congress leader said he was against politicisation of the air strike. "I feel uncomfortable that the PM does that. But it is his choice," Gandhi said. Addressing a poll rally in Wardha Friday evening, Gandhi accused Prime Minister Narendra Modi of hogging credit for the Balakot air strike and dared him to hold a rifle "for just five minutes" or travel alone in a bus in Jammu and Kashmir. The only thing "chowkidar" Modi did was to ensure "his boss" industrialist Anil Ambani got the Rafale fighter jet contract, Gandhi said. It was the Air Force personnel who displayed real valour by carrying out the air strike in Pakistan, he said.